Agr International is sad to announce the passing of our friend and colleague, Michael Kovac, following a courageous battle with cancer. Mike enjoyed traveling the world and meeting many customers over his 42 year career with American Glass Research. 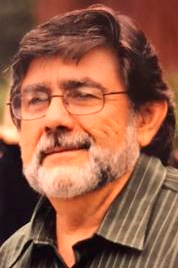 Mike was a expert in fracture diagnosis and container testing, and was respected by all who new him. He authored multiple papers relating to glass container performance and failure analysis, and taught fracture and design seminars in more than 30 different countries. As part of it efforts to continually expand the capabilities of its Process Pilot automated blowmolder control system, Agr International, Inc., has announced availability of the latest system enhancement, Individual Mold Control™. The addition of Individual Mold Control further expands the capabilities and the potential of Agr’s Process Pilot® product group to include the management of thickness distribution during PET bottle production on the individual mold level. Even with the most advanced PET bottle blowmolding system, there are variations in bottle material distribution from mold to mold. Each mold performs slightly different. This can be evidenced when analyzing bottles from a mold set, in the same region, as some produce thicker and some thinner distributions. These variations can result in inconsistent performance from bottles of the same production run, leading to potential downstream problems. In a collaborative effort between Agr and KHS, work was performed to develop a means to reduce or eliminate mold-to-mold variation, resulting in Individual Mold Control. Built on the foundation of Agr’s Process Pilot automated blowmolder control system, Individual Mold Control provides the ability to optimize the blow-molding process by controlling the blow parameters for each individual mold station, in addition to the global parameters set for all molds. This makes it possible to proactively manage the process down to the individual mold level to finely control material distribution and minimize mold-to-mold variation. With the Process Pilot system, high-precision thickness distribution measurements are captured on every bottle. Typically the Process Pilot system manages material distribution to a base-line thickness established on an overall average of all mold stations by controlling the oven parameters and P1 pressure as well as start time. These parameters are common to all the molds and move the material distribution close to baseline to produce a consistent quality of bottles. The Individual Mold Control option takes distribution management to a new level by identifying the distribution variance from mold to mold. Using an advanced control algorithm, the Individual Mold Control option provides the means to reduce individual mold station variability by proactively adjusting the pre-blow start time of each mold station through individual mold offsets. By doing this, the material distribution can be controlled on a per mold basis. This makes it possible to achieve an overall tighter distribution model over the entire mold set, much closer to the baseline than can be provided using the global approach. Furthermore, the level of trend analysis incorporated by Process Pilot on a mold station by station approach provides valuable data for targeted blowmolder maintenance. The Process Pilot with the Individual Mold Control option is compatible with rotary stretch blowmolding systems that incorporate independent mold station management. The Individual Mold Control option is currently available for KHS Series IV blowmolders. A retrofit version is also available for Process Pilot systems currently operating in the field. Agr’s Process Pilot automated blowmolder control system has proven to be a vital tool in the production of light weight bottles, while improving overall bottle performance and quality. It is unique in that it manages the blowmolder based on direct bottle measurements, on every bottle produced. By controlling the blowmolder based on direct feedback from bottle measurements rather than just blowmolder performance indicators, the Agr system can ensure that the final product has the desired quality and performance attributes in spite of environmental, blowmolder or material variations that occur during the production process. The addition of Individual Mold Control further compliments this. The creation of this facility is part of Agr International’s global expansion and commitment to its customers, and particularly intended to provide European glass manufacturers and fillers with better access to American Glass Research services. The new location will offer flexibility and reduced turnaround times on projects, lower shipping cost with relation to samples and the availability of American Glass Research expertise within the local time zones. In addition to providing European glass manufacturers and fillers with a range of testing and evaluation services, the new office will also offer a complete schedule of training seminars taught by the American Glass Research staff. 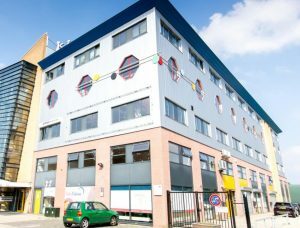 The new Delft facility will encompass 5500 square feet of laboratory and office space. Nearly 70% of the facility will be dedicated to the fracture analysis, measurement and testing laboratory. The lab will house new, modern testing equipment, microscopes and measurement equipment. The Delft testing laboratory will be headed by Peter de Haan, AGR Senior Scientist, and a Dutch national, who is returning to the Netherlands following several years at the American Glass Research Butler, PA, USA facility. De Haan and his team of technicians have well over 40 years of experience in the glass industry, and they will have full access to American Glass Research resources worldwide. American Glass Research is a division of Agr International, Inc.
At the 2017 Pack Expo show, Agr International, Inc. will be in booth 6727 featuring its Process Pilot blowmolder management system for managing the production and quality of PET beverage containers as well as its latest developments for shelf-life control and container testing. The Process Pilot® automated blowmolder management system was designed to simplify the production of PET bottles is ideal for PET bottle converters and beverage producers that self-manufacture PET bottles yet have limited manpower to oversee blowmolder operations on a continuous basis. 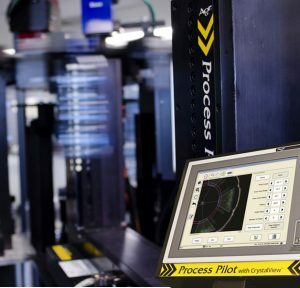 The Process Pilot product group offers precise material thickness distribution management on PET bottles, while offering hands-off blowmolder control. With the trend towards ever lighter bottles, the Process Pilot system offers producers the ability to aggressively light weight bottles to the absolute minimum while providing the confidence that material is distributed, with the proper thickness in all critical areas, on every bottle produced. Not only does this product simplify and stabilize the production of PET bottles, but it also provides the versatility to manage bottle production in a manner most suitable to the product and application. Whether the goal is to make the lightest bottle possible, process preforms of mixed lineage or material quality, improve bottle shelf-life and performance characteristics, save energy or just run a stable process 24/7, the Process Pilot product group offers a means to realize this goal profitably and with confidence. Agr International offers a number of products designed to assist container producers, converters and fillers stay competitive while meeting the increased quality demands of today’s changing world. Agr staff will be on hand at Pack Expo 2017, Booth 6727, to discuss their latest developments in the line of blowmolder management products as well as the complete line quality management products that include pressure testing, shelf-life, thickness measurement and dimensional gauging systems for plastic and glass containers. At the 2017 drinktec show, Agr International, Inc. will be exhibiting an array of products for managing the production and quality of beverage containers. Featured at this year’s show will be Agr’s latest developments for advanced blowmolder management, shelf-life control, and pressurized container testing. The Process Pilot® with CrystalView® automated blowmolder management system is ideal for beverage producers that self-manufacture PET bottles. 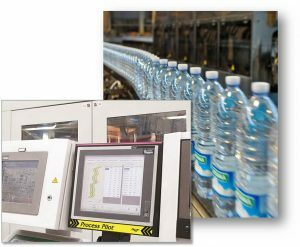 The Process Pilot product group offers precise material thickness distribution management on PET bottles, while offering hands-off blowmolder control. With the trend towards ever lighter bottles, the Process Pilot system offers producers the ability to aggressively light weight bottles to the absolute minimum while providing the confidence that material is distributed appropriately, with proper thickness in all critical areas, on every bottle produced. Not only does this product simplify and stabilize the production of PET bottles, but it also provides the versatility to manage bottle production in a manner most suitable to the product and application. Whether the goal is to make the lightest bottle possible, process preforms of mixed lineage, improve bottle shelf-life and performance characteristics, save energy or just run a stable process 24/7, the Process Pilot product group offers a means to realize this goal profitably and with confidence. Shelf-life management is an important but tedious measurement. Agr will feature several products that provide immediate determination of the permeability and shelf-life performance of newly produced PET bottles. These products make it possible to effectively manage (in real-time) a bottle’s shelf-life performance for oxygen ingress, CO2 or water loss. Whether your final product is packaged in a PET bottle, PET keg, aluminum bottle or glass bottle, accurate volume and proper pressure performance is paramount to the efficacy of the finished beverage container. Agr offers several testing products designed to aid bottle makers and beverage producers manage pressure and volume. The Agr PPT3000 offers a versatile solution for measuring volume expansion and pressure performance of containers manufactured from PET. Unlike other pressure testers, The PPT3000 actually simulates the rapid rise pressure profile that a container experiences during the filling cycle, providing valuable data that can be used to prevent filling line downtime due to premature pressure breaks. The SPT2, Agr’s latest addition to its product group, is an automated glass bottle testing system that performs precision volume measurement as well as pressure testing up to 1000 psi. Configurations are available for automated laboratory applications or along the production line as part of an automated sampling station. Visit Agr in Hall A4, stand 336. American Glass Research, a division of Agr International, Inc., recently continued it’s release of legacy white papers that have been completed throughout the last several decades. This release includes papers from 1959-1961. In 1959, Dr. Richard Mould in collaboration with Mr. Russell Southwick, both of Preston Laboratories (the predecessor and foundation of American Glass Research) prepared two papers entitled “Strength and Static Fatigue of Glass under Controlled Ambient Conditions, Part 1 and 2.” These papers further defined glass strength and how it should be properly measured. Dr. Mould continued the topic with two more papers, Part 3 and 4, in which he further defined critical aspects of glass strength. Visit the White Papers Library of American Glass Research to download these four papers and to view other papers authored by American Glass Research staff. The MBTxt is the latest in a line of small, portable thickness gauges offered by Agr International, Inc. This compact device features an advanced digital architecture and is capable of achieving extremely precise thickness measurements over a wide range. With a low range resolution of 0.1 μm, it is ideal for the packaging industry, especially the intricate requirements of bottle and container manufacturers. However, its applications are not limited to containers. Since the MBTxt can be used to measure all types of non-ferrous materials up to 24mm thick, it is also equally suitable for automotive, aerospace, medical and similar applications where very accurate measurements are required yet portability is essential. At times, glass bottle and container designs can be complex. With that, acquiring accurate thickness measurements in critical locations can be quite challenging. The conical shape of the MBT sensor probe facilitates measurement in very intricate locations. 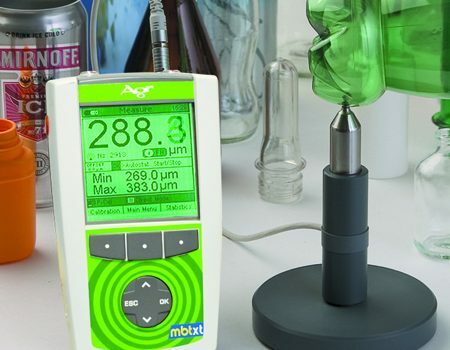 This feature on the MBTxt probes, the high accuracy, and wide measurement range create a powerful measurement system that is aptly suited for measuring the diverse range of products in many glass production facilities. Routine bottle sidewall thickness measurements, difficult areas such as bottle heel, base and finish regions as well as heavily decorated areas can be achieved with ease and precision. Even extremely difficult-to-measure regions such as corner areas on non-round containers can be measured with the same accuracy as routine sidewall measurements. In addition to measuring critical areas and complex shapes, the MBTxt can accommodate a range of material thicknesses. 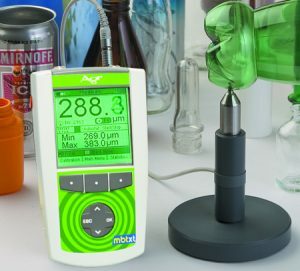 The availability of two easily interchangeable sensor probe options and the wide selection of target balls provide the versatility to measure very thin materials as encountered in tubing products and small vials with a low end range of 0-2mm (0.1 μm resolution) to applications where the material is very thick such as in champagne bottle bases, candle ware and similar products. The MBTxt is available in two models. The MBT7200xt, a basic version, includes real-time measurement, display of minimum and maximum thickness and storage of up to 100,000 values. The MBT7400xt, an advanced version, includes the same capabilities plus statistical graphing, trending capabilities and an expanded database. Interchangeable sensor probes are available for both units making it possible to configure the measurement range and precision appropriate for the application. A notable feature of the MBTxt is its expanded measurement range which is over twice the range of previous offerings. Based upon the “Hall Effect” principal, the MBTxt features an advanced sensor design that works in conjunction with specially treated target balls to achieve the highest precision and repeatability. Balls of this design provide improved measurement reproducibility of up to 0.5% over untreated balls. The new “xt” version offers two sensor options, with ranges from 0-9mm and 0-24mm. In addition to a re-designed sensor, the MBTxt is provided with a wider range of target balls, including specially configured “magnetic” balls, to facilitate greater flexibility and precision over an expanded thickness range. One of the most profound features of the MBT7200/7400xt Gauging System is in the design of the sensor probes. These incorporate a process called “integrated digital signal processing”, where all measuring signals are created and completely processed inside the sensor itself. Only completely processed digital readings are transferred to the base unit for display, statistical analysis and storage. Unlike analog devices, error influences on the measuring data during transfer over the cable (signal to noise ratio) are substantially reduced. This design ensures that measurements are true with the highest accuracy. The sensor probes on the MBTxt incorporate stainless steel housings and hardened carbide tips. This design provides for a long service life and limited wear to the probe tip even when working with hard materials such as glass. This is particularly important in the glass container industry. In order to provide the most versatility with the highest accuracy for the given task, a selection of calibration modes are included with the MBTxt. Available calibrations include a factory mode for quick and simple measurements, Zero point calibration (zero only) and multi-point calibration (zero + 1-4 points) for the highest accuracy. Once calibrated, the system’s “calibration memory” retains the calibration even with the unit turned off. The MBTxt devices are battery operated and completely portable. The base unit is sized to fit in one’s hand and the combined base unit and probe weigh less than 1 Kg (2.2 lbs.). Additionally, each unit is supplied with its own carrying case to house the base unit, probes and accessories making it easy to transport to any location. The internal data logger and statistical functions of the MBT7400xt facilitate data collection in production areas and QC laboratories, making it an ideal tool for data-gathering applications. A large digital display permits the operator to easily view current thickness readings as well as minimum and maximum measurements. Stored measurements can be transferred to other devices via an RS232 or USB connection. An optional foot switch is available for hands-free data capture. Regular pressure testing is essential to determining the integrity and performance attributes of PET bottles destined for pressure applications. Simulating real-world conditions is the only way to understand how bottles will perform under pressure during filling, in the warehouse and through retail channels. Without a proper pressure testing regimen, blowmolding problems can go unnoticed leaving bottle performance to chance, and with it, consequences that can be costly if bottles fail during filling or other downstream processes. 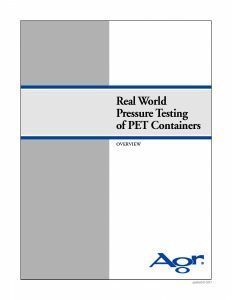 The whitepaper, “Real World Pressure Testing of PET Containers”, provides an insight to the science behind PET bottle pressure testing and its relationship to bottle filling. This paper discusses the container filling process and the forces that bottles experience, as well as the role that pressure and volume expansion testing play in this process. Download the paper now to learn the r eal story. Click here for more information on Agr’s PPT3000. 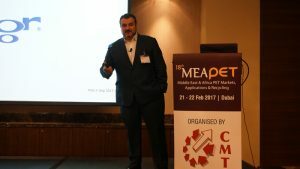 Agr’s Davide Bartoli, Regional Sales Manager, recently was a featured speaker at the MEAPET 2017 conference held February 21-22 in Dubai. MEAPET is a n annual conference regarding PET business for Middle East and African markets. Mr. Bartoli’s presentation focused on Agr’s global presence and it’s 3-step approach to improve quality and profitability in the production of PET bottles. 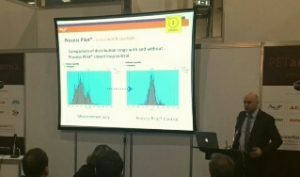 The presentation generated high interest in the Process Pilot product. Bartoli met with delegates from Middle East, Africa, Asia and Europe. The three-day Beviale Moscow is currently underway. As part of the event, PET Arena has a dedicated section with individual topic island areas for companies directly involved with PET. 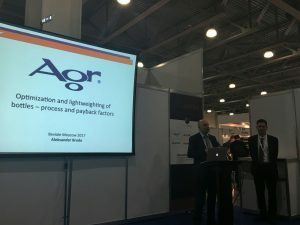 Agr Regional Director, Aleksander Broda, is participating in the PET Arena area along with providing presentations on the optimization and light weighting of bottles by using Agr’s Process Pilot systems. Nestlé Waters’ Sanpellegrino Group produces five brands of mineral water on twelve bottling lines in seven plants spread across Italy. These multiple operations are all guided by an overarching commitment: to deliver a consistent customer experience associated with each brand. A major aspect of the customer experience is bottle performance, from grip and handling to cap removal and pouring. Sanpellegrino goes to great lengths to ensure that every one of the millions of PET bottles it manufactures will conform to brand expectations. The key is exacting control of blowmolder operations, achieved with Agr’s on-line thickness measurement technology, the Process Pilot® Automated Blowmolder Control system. Process Pilot manages the blowmolder to virtually eliminate the effect of the process and environmental variables that can impact bottle material distribution, from fluctuations in weather and humidity to the differences between daytime and nighttime plant temperatures. Not only does the Process Pilot measure every bottle for changes in material distribution, but it also controls the blowmolder proactively to make sure the right amount of material winds up in the right place. Process Pilot proved its utility in an early light weighting initiative undertaken by Sanpellegrino’s premium Levissima brand, described as “Italy’s favorite local mineral water” and sourced from a mountain village in the Alps. The first bottling operation in Europe to deploy the closed loop Pilot system, the Levissima plant targeted a 22 percent weight reduction for its half-liter round bottle blown on a Sidel Series II Combi blowmolder—an enormous opportunity for material cost savings. Even with a stable history running at close to 40,000 bottles per hour, this was a major challenge for the integrated blowing and filling line. Lighter bottles produced on faster machines have a much narrower processing window. To deliver on customer expectations, bottle production has to strike the right balance between performance and weight. “With the Process Pilot installed on this line, managing the process, we were able to reduce the weight of our half-liter bottle to 9.5g while maintaining a very stable process,” relates Sanpellegrino’s Fabio Chimetto, Applications Group Packaging Manager. As part of a corporate-wide move toward standardized production lines, Sanpellegrino recently installed three additional Agr Process Pilots. One of these will be mated with a new Sidel Matrix Combi blowing/filling/capping system as the company replaces independent equipment with a modern, integrated approach. A project on tap for the new configuration is a further weight reduction in a 2-liter square bottle, down below 28g. Given Sanpellegrino’s vast bottle volumes, the initiative promises significant savings in material. Still, it can only move forward as long as the light weighting is accomplished without compromising bottle performance. The filled bottle, weighing two kilos, must remain convenient and reliable in consumer use–despite the shrinking margin of error in the blowing process. Having confirmed that Process Pilot’s automated controls maintain the desired material distribution throughout the production run, Sanpellegrino is confident of light weighting success. “The total cost reduction potential provided by Agr’s Process Pilot in labor, energy, scrap, and material looks to provide for rapid payback and offers a competitive return on investment,” Mr. Chimetto comments. The Process Pilot system enables Sanpellegrino to align efficient, advanced production lines with the customer-centric focus of its brands’ marketing strategy. “What is right for the consumer is not automatically the lowest weight,” Mr. Chimetto concludes. Mr. Kapsamer brings with him over 30 years of experience in the container manufacturing and beverage packaging industry. Prior to accepting the position at Agr, he held management positions with several major packaging equipment manufacturers including Husky Injection Molding Systems GmbH, where he held a number of senior positions over the last 10 years. Most recently, he held the position of Director Beverage Closures EMEA & SAARC for Husky. In that role, he was instrumental in growing Husky’s beverage closure business and expanding it throughout EMEA & SAARC countries. In addition to his role at Husky, Mr. Kapsamer has been a frequent speaker at packaging forums and conferences throughout Europe. Mr. Kapsamer will bring a wealth of knowledge and experience to the region for Agr, especially on the PET side of the business. 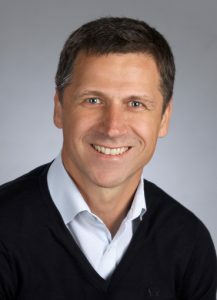 In addition to supporting Agr’s long-standing relationship with glass container producers, Mr. Kapsamer is uniquely positioned to expand Agr’s role with the rapidly growing beverage industry and the self-manufacture of PET bottles within that segment. Agr Northwestern Europe, with Mr. Kapsamer at the helm, will be well positioned to support the quality and process management needs of the industry within this region. 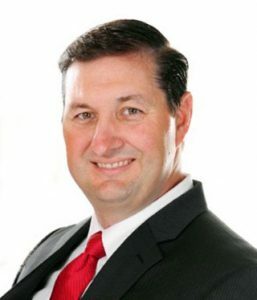 Agr International is proud to announce the appointment of William (Bill) Slusser to the position of “Director of Research” at American Glass Research. Under this new title, in a role he has already adopted, Bill will work to grow the business and expand the international reach of the American Glass Research division. Bill’s career and reputation with American Glass Research are now seventeen years in the making. Most recently, he lead the strong growth of the division through the expansion of portfolio services, the targeting of geographic development, and the introduction of new and improved educational seminars, now offered more often, and in more places around the world, than ever before. In addition to his strategic and management responsibilities, Bill also maintains his technical expertise in fracture diagnosis, performance testing and bottle design analysis through everyday Testing & Consulting Projects and as a Master-Level Seminar Instructor, having presented over 200 times in more than 20 countries. “While Bill certainly made strong contributions to American Glass Research during his years as a Project Leader and then as Manager, his greatest strength has been his willingness to pursue a vision, and his drive to successfully manage the reshaping of American Glass Research for the modern era. This new position will give Bill greater means to continue this work”, said Henry Dimmick, CEO of Agr International. American Glass Research, a leader in consulting, training and analytical services for the glass packaging industry since 1927, is located in Butler, PA, USA and is a division of AGR International Inc. In the works for several years, Agr International, Inc. has announced the commercialization of its CrystalView™ product for optimizing the material properties of PET bottles. The introduction of the CrystalView product further expands the capabilities and the potential of Agr’s Process Pilot® product group well beyond the measurement and management of material distribution. With this product, bottle manufacturers now have the means to run the coldest possible process in order to optimize bottles material properties (orientation) while maintaining target material distribution. As a result, the best strength to weight ratio for a given bottle design can be achieved, improving overall bottle performance and at the same time, reducing costs. The CrystalView measurement system offers a simple, reliable and hands-free means to accomplish the optimization of PET material properties without overstretching or going beyond the temperature boundaries that cause molecules to break and create pearlescence. The CrystalView system manages the process to the point where it is “just right”; avoiding the creation of pearlescence by detecting the very edge of where the process gets too cold and pearlescence begins to form. With CrystalView, it is possible to reduce the preform processing temperature to the ideal processing point (as much as 10 deg. C) for a given bottle design. The CrystalView measurement system incorporates a set of discrete vision components that are mounted inside a reheat stretch blowmolder. As bottles exit the mold, the CrystalView system scans every bottle for the onset of pearlescence. During operation, sophisticated control algorithms incorporated into the CrystalView system actively monitor the levels of pearlescence. In conjunction with the Agr Process Pilot automated blowmolder management system, and based on a learned mathematical model that identifies the ideal control variables, adjustments are continuously made, including preform temperature, to manage bottle production to the point where the PET material properties are fully optimized, at a level just before the onset of pearlescence. The CrystalView system also offers the potential for significant savings along with improved bottle performance in a number of areas including blower energy consumption (from 7-10%), materials savings through expanded light weight potential and Improved downstream efficiencies as a result of decreased downtime losses during filling and processing operations. Optimize the bottle structure for maximum performance. The Measure and control portion of the Process Pilot program has been on the market for a number of years and boasts an installed base of over 200 systems. The CrystalView product fulfills the third segment, Optimization. The CrystalView™ system is available as an add-on option to the Process Pilot automated blowmolder management system for all new purchases. A retrofit version is also available for Process Pilot systems currently operating in the field. Agr’s Process Pilot automated blowmolder control system has proven to be a vital tool in the production of light weight bottles, while improving overall bottle performance and quality. It is unique in that it manages the blowmolder based on direct bottle measurements, on every bottle produced. 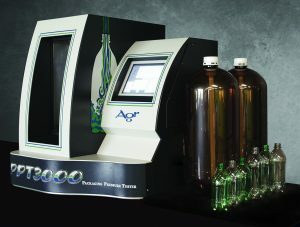 By controlling the blowmolder based on direct feedback from bottle measurements rather than just blowmolder performance indicators, the Agr system can ensure that the final product has the desired quality and performance attributes in spite of environmental, blowmolder or material variations that occur during the production process. The CrystalView system further enhances the value of the Process Pilot product group. The MBTxt is the latest in a line of small, portable thickness gauges offered by Agr International, Inc. This compact device features an advanced digital architecture and is capable of achieving extremely precise thickness measurements over a wide range. With a low range resolution of 0.1 μm, it is ideal for the packaging industry, especially the intricate requirements of container manufacturers. However, its applications are not limited to containers, as the MBTxt can be used to measure all types of non-ferrous materials up to 24mm thick. The MBTxt devices are offered in two models; the MBT7200xt, a basic version that includes real-time measurement, display of minimum and maximum thickness and storage of up to 100,000 values. The MBT7400xt, an advanced version, includes the same capabilities plus statistical graphing, trending capabilities and an expanded database. Interchangeable sensor probes are available for both units making it possible to configure the measurement range and precision appropriate for the application. A notable feature of the MBTxt is its expanded measurement range which is over twice the range of previous offerings. Based upon the “Hall Effect” principal, the MBTxt features an advanced sensor design that works in conjunction with specially designed target balls to achieve the highest precision and repeatability. The new “xt” version offers two sensor options, with ranges from 0-9mm and 0-24mm. In addition to a re-designed sensor, the MBTxt is provided with a wider range of target balls, including specially configured “magnetic” balls, to facilitate greater flexibility and precision over a wider thickness range. The internal data logger and statistical functions of the MBT7400xt facilitate data collection in production areas and QC laboratories, making it an ideal tool for data-gathering applications. A large digital display permits the operator to easily view current thickness readings as well as minimum and maximum measurements. Stored measurements can be transferred to other devices via an RS232 or USB connection.